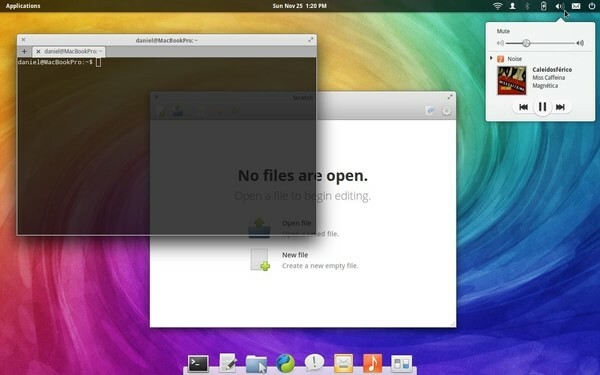 Elementary is a Macintosh OS look alike (some prefer the word inspired) Linux operating system that is based on Ubuntu 14.04 LTS. This means they can work on their release for as long as they want, given that the LTS version on which it is based will continue to receive support from Canonical until 2019. The distro uses its own shell named creepily enough Pantheon. The emphasis is on beauty and lightweight demand on resources, something I think they have achieved. The beta ran well on my creaky 4GB Core i3 Fujitsu laptop, something the Other operating system on the laptop would do well to emulate. The developers decided to throw convention out of the window when they made the OS. Gala (from Mutter) is used as the default Window Manager which means the project has an eye on the future. The release is named Freya for the old Norse goddess for beauty and love. The release has the former in spades and outdoes Linux Mint on every front in the aesthetics department although it being a beta release means you can be forced to see its “ugly” underlying code on the rare occasions it breaks down and snarls and passes a lot of cryptic messages on the screen. The project leader Daniel Foré had initially named the project ISIS (after the Egyptian goddess) but had to, like a host of other international companies, quickly rename the project after the name became increasingly associated with the notorious terrorist group which has links to the infamous Boko Haram in Africa. You can download the ISO (64 bit or 32 bit) from the project’s site. The ISO work for both PC (your Windows running machine) or Mac ( it’s a Mac look-like so I don’t know why on earth you would do that but I am sure it is nice to know you can). You will be asked to give a small donation of your choice before you proceed to the download page. You can always bypass this by entering $0. The file is just under 1GB in size and is served on the Tenet in South Africa mirror which means the download should be a little bit fast. Since the distro uses Ubuntu as its base this means that you can use the local ZOL mirror repository to keep the Ubuntu part of it up to date. It makes use of international repositories for the Elementary components so you should only update it during the off-peak periods when the downloads will not count towards your data. The ZOL mirror should automatically take effect after you select Zimbabwe as you country during installation but if it doesn’t just make http://zw.archive.ubuntu.com is the source URL for your trusty/main repository. You can also test the distro on a live USB using Pendrive USB installer. If you are one of those people that dream and wish to use a Mac but are too poor to shell out the bucks to get the real experience then this is the OS/distro for you. I have never had the Mac experience myself but this is the land of fake Samsung Galaxies and all, so the OS and its “goals” ( they do not say anywhere that they want to mimic Apple’s OS X but it’s implied in the user experience) should not be strange. The Ubuntu base gives the OS an added appeal and so does its modest demand on resources whilst bringing beauty and moderness to your Desktop. It should be noted that this is a Beta so if you are one of those people who feel squirmish at the sight of the blackscreen/ terminal you might well want to keep you distance although the system hardly ever crashed for me (just once after I deliberately messed with the graphics). Now that you’ve dipped your toes, why not go up to your knees by trying a hackbook pro? Apparently several models from HP’s Probook series can run OSX like a champ with minimal fiddling about (it just needs a small hardware fix to enable wifi, but a wifi dongle works just as well). It could make for an interesting write up. Making a Hackintosh is a dark art my friend. I will see if I can pull it off and make a write up. If you want to try elementary OS i suggest you have a well kitted Rig. If you have less than 4GB ram forget it. I tried it with a machine with 2GB ram and it barely worked. It’s not a cheap alternative or fake apple – it’s an open source Linux Distro and should be treated as such, not as just some cheap alternative. I think you misunderstood the cheeky pun “cheap” it means the operating system is free as compared to OSX which comes on a multi-thousand dollar laptop which you can admit is expensive (not cheap). Personally I wasn’t impressed by the OS at all because besides beauty it offers nothing that Ubuntu (its base) does not provide. The OS is meant to be light weight and therefore you shouldn’t expect a ton of apps pre-installed. You can always add more apps from the software centre. The focus of Elementary OS is user experience and they want it to be as easy as possible for anyone new to Linux (hence elementary). Cheap and Free are two completely different things. ““cheap” it means the operating system is free…”.. Cheap does not necessarily mean free, maybe consider changing your title to “Elementary OS: A good looking free Apple lookalike” and rewrite your article along those lines. I was expecting a bit more from your review of the operating system e.g. Apps that come preinstalled and how you rate them (scratch, midori, geary, calendar…) and more screenshots. I recently installed Elementary OS on an Asus netbook, and it seems to run fine. It is indeed one of the most “beautiful” distros available, with stunning looks. Two points of disappointment though – the built in web browser Midori does not contain Flash, so playing video doesn’t work. I googled for a fix, but got more and more bogged down. I ended up installing Chrome, after a lot of “research”. Secondly, it didn’t manage to find my network printer, something that Ubuntu 14.10 did without too much trouble. A shame really, as Elementary OS is far more “beautiful” than Ubuntu. Maybe the printing utility cups was not installed by default. Thanks for your feedback, Garikai. Being fairly new to all this, how do I get around your suggestion…..??? Enter your password and wait for the installation to complete. NB This requires you to have an active internet connection. I would go for Linux deepin any time, the Chinese did a great job with the design here, and its ubuntu based too.Its a bit heavy though but can run on a 1.5 GB Ram machine.